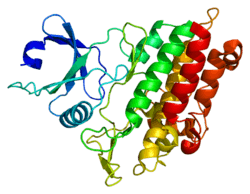 Activin receptor type-1B is a protein that in humans is encoded by the ACVR1B gene. ACVR1B or ALK-4 acts as a transducer of activin or activin like ligands (e.g., inhibin) signals. Activin binds to either ACVR2A or ACVR2B and then forms a complex with ACVR1B. These go on to recruit the R-SMADs SMAD2 or SMAD3. ACVR1B also transduces signals of nodal, GDF-1, and Vg1; however, unlike activin, they require other coreceptor molecules such as the protein Cripto. Activins are dimeric growth and differentiation factors which belong to the transforming growth factor-beta (TGF-beta) superfamily of structurally related signaling proteins. Activins signal through a heteromeric complex of receptor serine kinases which include at least two type I (I and IB) and two type II (II and IIB) receptors. These receptors are all transmembrane proteins, composed of a ligand-binding extracellular domain with a cysteine-rich region, a transmembrane domain, and a cytoplasmic domain with predicted serine/threonine specificity. Type I receptors are essential for signaling, and type II receptors are required for binding ligands and for expression of type I receptors. Type I and II receptors form a stable complex after ligand binding, resulting in phosphorylation of type I receptors by type II receptors. This gene encodes activin A type IB receptor, composed of 11 exons. Alternative splicing and alternative polyadenylation result in 3 fully described transcript variants. The mRNA expression of variants 1, 2, and 3 is confirmed, and a potential fourth variant contains an alternative exon 8 and lacks exons 9 through 11, but its mRNA expression has not been confirmed. 1 2 "Entrez Gene: ACVR1B activin A receptor, type IB". ↑ Inman GJ, Nicolás FJ, Callahan JF, Harling JD, Gaster LM, Reith AD, Laping NJ, Hill CS (2002). "SB-431542 is a potent and specific inhibitor of transforming growth factor-beta superfamily type I activin receptor-like kinase (ALK) receptors ALK4, ALK5, and ALK7". Mol. Pharmacol. 62 (1): 65–74. doi:10.1124/mol.62.1.65. PMID 12065756. ↑ Harrison CA, Gray PC, Koerber SC, Fischer W, Vale W (2003). "Identification of a functional binding site for activin on the type I receptor ALK4". J. Biol. Chem. 278 (23): 21129–35. doi:10.1074/jbc.M302015200. PMID 12665502. 1 2 De Winter JP, De Vries CJ, Van Achterberg TA, Ameerun RF, Feijen A, Sugino H, De Waele P, Huylebroeck D, Verschueren K, Van Den Eijden-Van Raaij AJ (May 1996). "Truncated activin type II receptors inhibit bioactivity by the formation of heteromeric complexes with activin type I. receptors". Exp. Cell Res. 224 (2): 323–34. doi:10.1006/excr.1996.0142. PMID 8612709. ↑ Attisano L, Wrana JL, Montalvo E, Massagué J (March 1996). "Activation of signalling by the activin receptor complex". Mol. Cell. Biol. 16 (3): 1066–73. PMC 231089 . PMID 8622651. Human ACVR1B genome location and ACVR1B gene details page in the UCSC Genome Browser. Welt CK (2002). "The physiology and pathophysiology of inhibin, activin and follistatin in female reproduction". Curr. Opin. Obstet. Gynecol. 14 (3): 317–23. doi:10.1097/00001703-200206000-00012. PMID 12032389. Xu J, Matsuzaki K, McKeehan K, Wang F, Kan M, McKeehan WL (1994). "Genomic structure and cloned cDNAs predict that four variants in the kinase domain of serine/threonine kinase receptors arise by alternative splicing and poly(A) addition". Proc. Natl. Acad. Sci. U.S.A. 91 (17): 7957–61. doi:10.1073/pnas.91.17.7957. PMC 44523 . PMID 8058741. Cárcamo J, Weis FM, Ventura F, Wieser R, Wrana JL, Attisano L, Massagué J (1994). "Type I receptors specify growth-inhibitory and transcriptional responses to transforming growth factor beta and activin". Mol. Cell. Biol. 14 (6): 3810–21. PMC 358748 . PMID 8196624. De Winter JP, De Vries CJ, Van Achterberg TA, Ameerun RF, Feijen A, Sugino H, De Waele P, Huylebroeck D, Verschueren K, Van Den Eijden-Van Raaij AJ (1996). "Truncated activin type II receptors inhibit bioactivity by the formation of heteromeric complexes with activin type I. receptors". Exp. Cell Res. 224 (2): 323–34. doi:10.1006/excr.1996.0142. PMID 8612709. Attisano L, Wrana JL, Montalvo E, Massagué J (1996). "Activation of signalling by the activin receptor complex". Mol. Cell. Biol. 16 (3): 1066–73. PMC 231089 . PMID 8622651. Lebrun JJ, Vale WW (1997). "Activin and inhibin have antagonistic effects on ligand-dependent heteromerization of the type I and type II activin receptors and human erythroid differentiation". Mol. Cell. Biol. 17 (3): 1682–91. PMC 231893 . PMID 9032295. Röijer E, Miyazono K, Aström AK, Geurts van Kessel A, ten Dijke P, Stenman G (1998). "Chromosomal localization of three human genes encoding members of the TGF-beta superfamily of type I serine/threonine kinase receptors". Mamm. Genome. 9 (3): 266–8. doi:10.1007/s003359900745. PMID 9501322. Hashimoto O, Yamato K, Koseki T, Ohguchi M, Ishisaki A, Shoji H, Nakamura T, Hayashi Y, Sugino H, Nishihara T (1998). "The role of activin type I receptors in activin A-induced growth arrest and apoptosis in mouse B-cell hybridoma cells". Cell. Signal. 10 (10): 743–9. doi:10.1016/S0898-6568(98)00021-7. PMID 9884026. Lebrun JJ, Takabe K, Chen Y, Vale W (1999). "Roles of pathway-specific and inhibitory Smads in activin receptor signaling". Mol. Endocrinol. 13 (1): 15–23. doi:10.1210/mend.13.1.0218. PMID 9892009. Gray PC, Greenwald J, Blount AL, Kunitake KS, Donaldson CJ, Choe S, Vale W (2000). "Identification of a binding site on the type II activin receptor for activin and inhibin". J. Biol. Chem. 275 (5): 3206–12. doi:10.1074/jbc.275.5.3206. PMID 10652306. Zhou Y, Sun H, Danila DC, Johnson SR, Sigai DP, Zhang X, Klibanski A (2000). "Truncated activin type I receptor Alk4 isoforms are dominant negative receptors inhibiting activin signaling". Mol. Endocrinol. 14 (12): 2066–75. doi:10.1210/me.14.12.2066. PMID 11117535. Su GH, Bansal R, Murphy KM, Montgomery E, Yeo CJ, Hruban RH, Kern SE (2001). "ACVR1B (ALK4, activin receptor type 1B) gene mutations in pancreatic carcinoma". Proc. Natl. Acad. Sci. U.S.A. 98 (6): 3254–7. doi:10.1073/pnas.051484398. PMC 30640 . PMID 11248065. Chapman SC, Woodruff TK (2001). "Modulation of activin signal transduction by inhibin B and inhibin-binding protein (INhBP)". Mol. Endocrinol. 15 (4): 668–79. doi:10.1210/me.15.4.668. PMID 11266516. Wurthner JU, Frank DB, Felici A, Green HM, Cao Z, Schneider MD, McNally JG, Lechleider RJ, Roberts AB (2001). "Transforming growth factor-beta receptor-associated protein 1 is a Smad4 chaperone". J. Biol. Chem. 276 (22): 19495–502. doi:10.1074/jbc.M006473200. PMID 11278302. Parks WT, Frank DB, Huff C, Renfrew Haft C, Martin J, Meng X, de Caestecker MP, McNally JG, Reddi A, Taylor SI, Roberts AB, Wang T, Lechleider RJ (2001). "Sorting nexin 6, a novel SNX, interacts with the transforming growth factor-beta family of receptor serine-threonine kinases". J. Biol. Chem. 276 (22): 19332–9. doi:10.1074/jbc.M100606200. PMID 11279102. Birkey Reffey S, Wurthner JU, Parks WT, Roberts AB, Duckett CS (2001). "X-linked inhibitor of apoptosis protein functions as a cofactor in transforming growth factor-beta signaling". J. Biol. Chem. 276 (28): 26542–9. doi:10.1074/jbc.M100331200. PMID 11356828. Bianco C, Adkins HB, Wechselberger C, Seno M, Normanno N, De Luca A, Sun Y, Khan N, Kenney N, Ebert A, Williams KP, Sanicola M, Salomon DS (2002). "Cripto-1 activates nodal- and ALK4-dependent and -independent signaling pathways in mammary epithelial Cells". Mol. Cell. Biol. 22 (8): 2586–97. doi:10.1128/MCB.22.8.2586-2597.2002. PMC 133714 . PMID 11909953.